Want to increase your silent auction revenue? Check your bid increments! What’s another $100 to one of your bidders? Well, it could mean $8,000 to you! No, really. Small errors in starting bids and bid increments can cost you thousands of dollars. 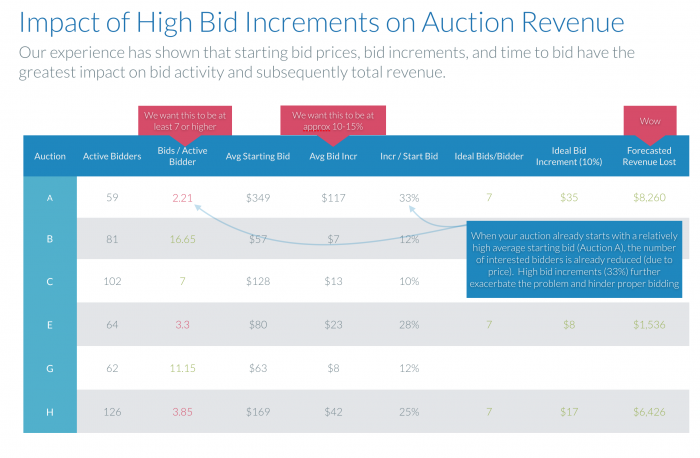 Let’s dive into the impact that high bid increments can have on your silent auction revenue. It could mean big bucks for your cause. Setting bid increments correctly is important. Silent auctions typically have fixed bid increments (there is no live auctioneer persent to hype your crowd or to lower the bid increment to solicit that next bid). When someone doesn’t bid on an item because the next bid is too high for them, there is little you can do. So what should you set them at? Set them as low as possible. We recommend ~10% of your starting bid price. For more details on this, please review our blog post on properly setting bid increments. It’s simple, really. If your bid increments are too high, you will shut out bidders who are either unwilling to or can’t increase their bid by that amount. If that bidder doesn’t increase their bid, it won’t prompt others to react and the spiral “bidding effect” you are hoping for won’t get going. You need traction on items (that means bidders are bidding). Bidders won’t increase their bid unless they have to; and they only have to if they’re outbid. Once the bidding gets going your bidders’ competitive streak may ignite, creating a real emotional attachment to the item they’re after! !It is hard to create that energy and emotion when your bid increments are set sky high. Bids drive revenue, plain and simple. Every bid is an increase in your auction revenue. You want every opportunity to increase those bids. To see some real-life examples, lets look at a small collection of auctions that have recently run on Handbid. From the illustration, it is evident that auctions with higher average bid increments (as a percentage of their starting bid) had lower bids/active bidder. Most auctions at Handbid have seen bids/bidder anywhere from 7 to more than 20. In most cases, this is because the bid increments are low enough to encourage people to bid higher. Makes sense right? It is much easier for your bidder to bump their bid when they’re asking, “what’s another $10” instead of “what’s another $100.” That $90 you think you are losing from the bid increment could actually be thousands!